"I've been trying to download KMPlayer on my Mac, however when I try to open it, it opens with the app TextEdit. I don't know what is going on and I’m wondering whether there is practical KMPlayer for Mac or not?" Actually, KMPlayer(The KMP) is the abbreviation of K-Multimedia Player which is a media player for Windows and can play many video formats like VCD, DVD, AVI, MKV, MPEG-1/2/4, QuickTime and more. This free media player is favored by most of people all the time due to its outstanding performance in video playing and editing. It is worth mentioning that after its Mobile App was released on March 15, 2014, more and more people began to download KMP APP on their phones and tablets. But don’t think the media player is suitable for everyone, because, as above mentioned, it isn't available on Mac computer. Here, for making you freely play and watch HD or 4K UHD videos on your Mac, we introduce you the best KMPlayer alternative for Mac OS X. In fact, some people feel it's a pity that KMPlayer developers don't have any schedule to release Mac version. 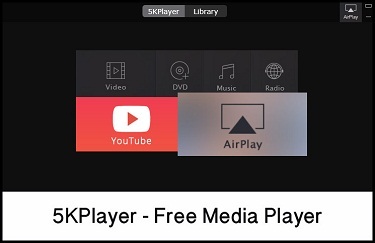 Therefore, they have no chance to use KMPlayer for streaming various HD format videos and movies on Mac OS X. Besides, only MOV, M4V and MP4 formats belong to the standard Apple media formats. To put it in another way, users need to spend much time on looking for proper media player for Mac that supports a large number of video formats like AVI, FLV, MP4, WMV, M4V and more. However, for quickly solving your problem, MacX Video Converter Pro is highly recommended for you. Built in 320+ video and 50+ audio codecs, it has a strong ability to convert all of your AVI, MKV, RMVB, FLV files to a standard Apple media format with 83x faster speed and no quality loss, for example, convert AVI to MOV, MKV to MP4, FLV to M4V, etc. And MacX Video Converter Pro also can directly convert various SD and HD (1080P/2160P/4320P) videos to iPhone/iPad/QuickTime/iMovie/iTunes or other Apple devices. Thus, you can easily play and watch your converted 4K/8K video files on your Mac without any limitation. What's more, this video converter is capable of downloading and converting online 1080P/4K/8K videos from YouTube, Vimeo, Vevo, Facebook, Dailymotion, etc 300+ sites. That is to say, you are allowed to watch funny dog videos, baby videos, Disney movies, MV or favorite TV series on your Mac computer or Apple mobile devices. Before moving to editing steps, you should get Mac version and install it on your Mac computer. 1Load video. Launch this functional software and click "Add File" button to load the video you want to convert. 2Choose the output format. 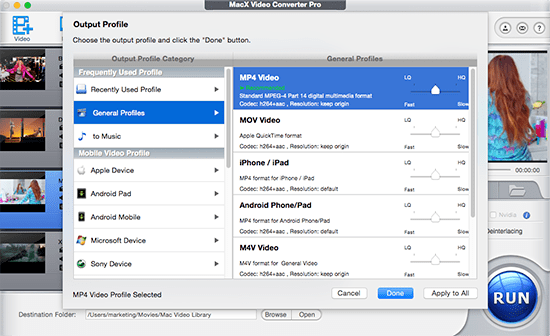 Here you can select standard Apple media formats (MP4, MOV and M4V) from the popup output profile window. Of course, if you want to convert video to iPad iPhone iTouch, you also can hit "Apple Device" to choose the specific Apple device. 3Specify the output folder. Click the "Browse" button to specify an output folder on your computer to save the output files. 4Press the "RUN" button. Click "RUN" button to start converting process. Note: Before hitting "RUN" button, you also can take advantage of other editing feature from MacX Video Converter Pro to personalize your videos, for instance, clip video, crop frame size, merge separate videos into a new one and even add watermark/subtitle to video. Serving as a free HD video player, music player, AirPlay media streamer and online video downloader, this alternative to KMPlayer for macOS has received much praise from users so far. 5KPlayer is able to: play HD videos (4K/5K/1080p)/DVDs/radio with revolutionary design, play MP3 AAC APE FLAC music perfectly to activate your senses and also download online videos from YouTube, Dailymotion, Vimeo, Vevo, Facebook, etc. Certainly, the most important thing is that 5KPlayer is available both on Windows and Mac OS X. Also as a free media playing software, VLC can runs in Windows, Mac OS X and Linux. It can easily play DVDs, VCDs, Audio CDs, web streams and more. And if you compare VLC to KMP, you can easily get a conclusion: beyond the common video formats supported by KMP, VLC also supports replaying M4V, MTS, OGM, M2P, XVID, 3G2, MOD, AAC, M3U, MID file formats. In addition, VLC can transcode multimedia files and compress video files. Want to try this KMPlayer for Mac-VLC? You can download from https://www.videolan.org/vlc/.